A book by a former football player is generally not the kind of book that I am drawn to. I was never an athlete and did not go to a school that put importance into sports programs for girls. However, it was these very reasons that encouraged me to read "The Power-Based Life" by Mike Flynt. Flynt played football for Permian High School in Odessa, Texas. The football team's winning tradition helped inspire a now popular inspirational television series called "Friday Night Lights." I knew that I was missing out on a lot of personal discipline lessons by not growing up playing sports. Having watched athletes train and perform affirmed the fact that it takes a lot of character-building to take on a mindset of being able to compete with grace, determination and dignity. While the title of the book is accurate, it can be misleading. I expected a lot of canned motivational quotes that totally mean nothing to me. In fact, it is nothing what I assumed it would be. Flynt's testimony on how he became the oldest member of a college football team in NCAA history is something worth reading about. It is an unusual and impressive achievement. But what is more admirable is how Flynt gives all of the credit to God and none of his own. Flynt is very bold in sharing how God has enabled him to succeed in his journey -- as a player, as a coach, and as an entrepreneur. He holds nothing back in sharing his faith. 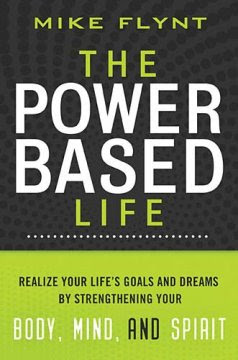 Most of the book gives notable lessons on determining your personal "power bases" which are the sources of our strengths. Once these are discovered, we can live out a lives in the way God designed it to be. Flynt's principles become more achievable when he explains them through personal, first-hand experiences and Biblical teachings. I personally found these principles relevant and empowering -- even to a non-athlete like myself. The second quarter of this year just started. If you feel that there is a need for you to re-group. re-focus on your goals for 2011, I recommend that you give this book a shot. It might just be the 'push' that you need to get things going. Disclosure of Material Connection: I received this book free from Thomas Nelson as part of their Blogger Review Program. I was not required to write a positive review. The opinions I have expressed are my own. I am disclosing this in accordance with the Federal Trade Commision's 16 CFR, Part 255: "Guides Concerning the Use of Endorsements and Testimonials in Advertising."